Arrive in Havana and enjoy a day at leisure. Wander the streets and marvel at the neoclassical and baroque architecture. Look for Glass Art – coloured glass panels known as ‘medio puntos’ over doors and windows. Explore Old Havana on a guided walking tour. Walk among its World Heritage colonial architecture and cobblestone streets. Visit Plaza Vieja, Plaza de Armas, Cathedral Square, and Plaza de San Francisco de Asis. Wander through the colourful markets viewing the living statues as well as street actors and picturesque parades. Enjoy a full day guided tour to the Vinales Valley in Pinar del Rio province, admiring the changing scenery along the way. Travel through the spectacular Sierra del Rosario and stop for a short while a small tobacco plantation. Continue on to beautiful Viñales Valley and take in the spectacular views from the lookout Los Jazmines. The valley boasts some of the best scenery in Cuba, consisting of cliffs, caves, hills and lush tobacco fields. Spend some time touring the town of Viñales, Dos Hermanas valley, visit an enormous prehistoric mural painted on a rock face, and then tour Cueva del Indio. Once here, you’ll board a boat and travel along the underground river that runs through this large limestone cave. The hotel has been rebuilt behind its original facade and offers a mix of classical style with modern comforts. A rooftop pool and terrace offer great views of the imposing Capitolio building. The hotel restaurant has authentic local dishes or you could enjoy a drink at the bar. 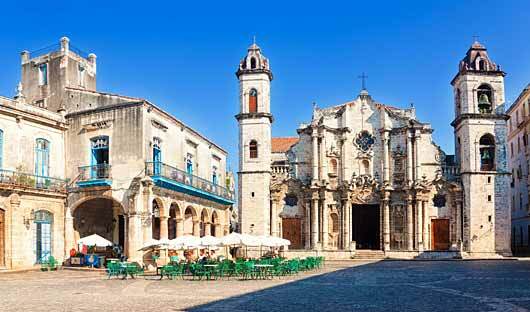 Located in the heart of old Havana on the leafy main square after which it is named. The building has been designed in a classical style, blending in with the surrounding palaces, theatres, and museums. The guest rooms are in two neighbouring buildings; a colonial wing and a modern wing, which are connected by an underground tunnel. 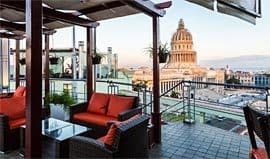 The hotel features a restaurant and a bar where guests can relax of an evening and a rooftop pool where views of Havana’s historic buildings can be admired. Fly to Santiago de Cuba. You have the afternoon to explore or simply relax. 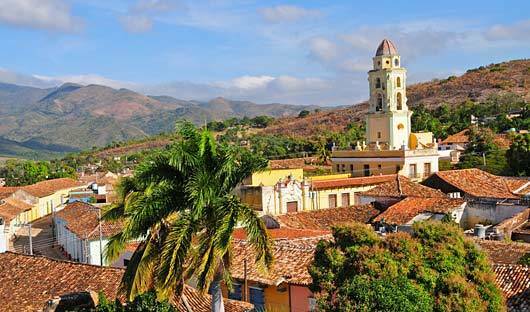 Explore Santiago de Cuba on a guided city tour and visit El Morro Castle. Visit La Loma de San Juan, the site where the decisive last battle of the Spanish-Cuban-American War was fought, the Plaza de la Revolucion dominated by the Monumento Maceo, the exterior of the Santa Ifigenia Cemetery where many very famous Cubans are buried, and the Moncada Barracks. Visit the Habanos House and the Caney Rum bar to gain an insight into how these two products are processed. A stop at Céspedes Park will give you the opportunity to share time with locals, have a look in the stores, or take wonderful photos. This hotel is a unique, post-modern high-rise and the largest hotel in Santiago. The rooms are large with huge windows offering excellent views. Rooftop bar and lounge has walls of glass and wonderful 360 views of the city, The hotel has a pool, Jacuzzi and plenty of areas to relax and enjoy the outdoors. 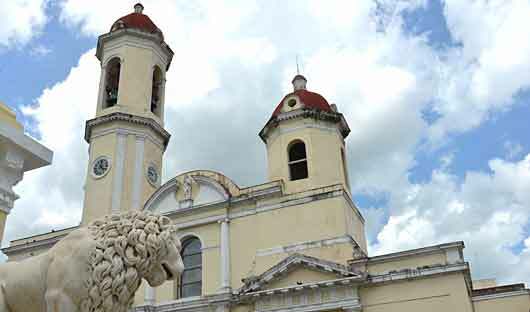 Drive to Bayamo where you will discover the rebellious spirit of Bayamo on a walking tour featuring the city`s highlights. 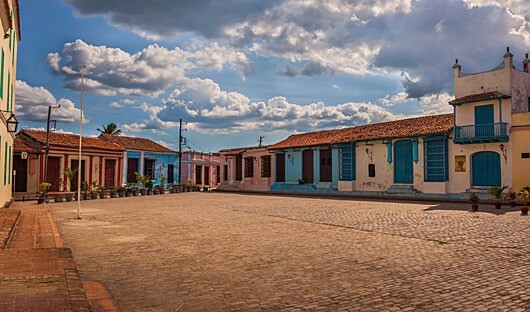 Wander around the town centre to learn about the history of Cuba. Daily life here resolves around Céspedes Park, the Hymn Square and Céspedes Birth place (museum and monument). After lunch continue to the inland city of Camaguey, founded in 1514 by the Spanish and one of the largest and best-preserved on Cuba’s cities. A labyrinth of winding streets and white-washed houses the city can be confusing for visitors however the irregular street pattern was a deliberate creation to confuse would-be attackers in the past, such as pirates. 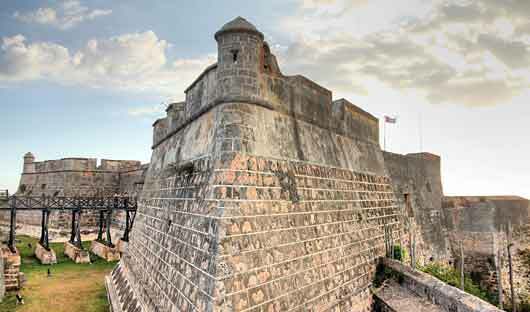 This morning enjoy a walking tour through the rich colonial-style UNESCO World Heritage centre of the city of Camaguey. Discover its irregular, intricate network of streets while admiring the architectural beauty of: San Juan de Dios Square, Ignacio Agramonte Park, a local Casa de la Trova (house of traditional salsa music and dancing), and the Worker’s Square among other local attractions. The afternoon will be spent at Sancti Spiritus. One of the original seven cities founded by the Spanish in the 16th century it is a true colonial jewel. On arrival, enjoy a short walking tour. Wander through the cobbled streets, past the quaint colonial churches and houses, and through peaceful plazas. The evening will be spent in Trinidad. Enjoy a full day tour of Sugar Mill Valley and Trinidad. Discover Cuba’s past African connection as you drive to “Valle de los Ingenios” – Sugar Mill Valley. Here the economic importance of sugar and its link to the slave trade are explained. Visit the Torre de Manacas-Iznaga Sugar mill, one of the original sugar plantation mansions, and climb to the top of the tower to enjoy some of the best country views in Cuba. Continue to Trinidad for lunch at a local restaurant. Wander through the historical centre of Trinidad, a beautiful city full of stunning colonial architecture. Tour Plaza Mayor, Museo Romántico, and stop at La Canchánchara bar to taste a Cuban cocktail made with rum, lemon and honey. The building was originally built in the 1930’s, and has now been completely restored to its former colonial splendour. The 40 spacious guestrooms are tastefully appointed with dark wood furnishings spanning two floors and surrounding a light filled interior courtyard. Arrive in Cienfuegos, the Pearl of the South, sits on a bay that opens out to the Caribbean Sea. 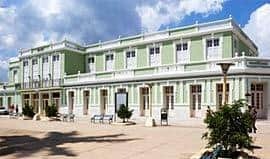 This provincial city, one of the youngest and most beautiful cities of Cuba, was founded in 1819 with the name of ‘Villa Fernandina de Jagua’ and displays both its Spanish colonial history and a strong French influence in its fine neoclassical architecture. 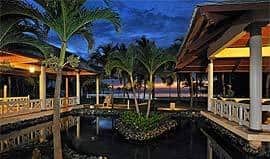 Attractions include the Moorish styled Palacio de Valle and nearby Castillo de Jagua, a fortress completed in 1745 to protect the bay from pirates who sought to take refuge there. Enjoy a panoramic tour that includes the National Monument (La Punta), El Palacio de Valle, El Paseo del Prado followed by a stroll along the boulevard to visit the monument to one of Cuba`s most treasured musicians, Beny Moré. Spend time in the city’s heart to visit the Cathedral as well as Teatro Thomas Terry, one of Cuba’s oldest and most beautiful theatres, dating from 1895. 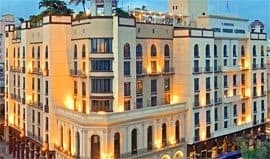 Continue to Havana where you will be dropped off at your hotel. 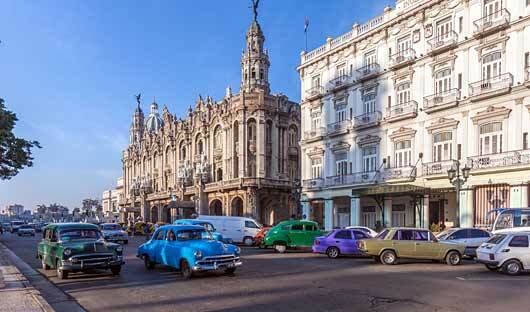 Depart your hotel this morning on a half-day tour through old colonial Havana in a vintage car. During the tour, your guide will show you the main squares of the colonial area: Plaza de Armas, Plaza de San Francisco de Asis, Plaza Vieja and Plaza de la Catedral. After tasting a Cuban cocktail, you will be driven in a vintage car through the modern part of the city. Along the way you’ll drive past Revolution Square, the University of Havana, National Hotel, Capitol Building and the former Presidential Palace. After the tour, return to your hotel. The following morning your tour concludes and you will be met and transferred to the airport. 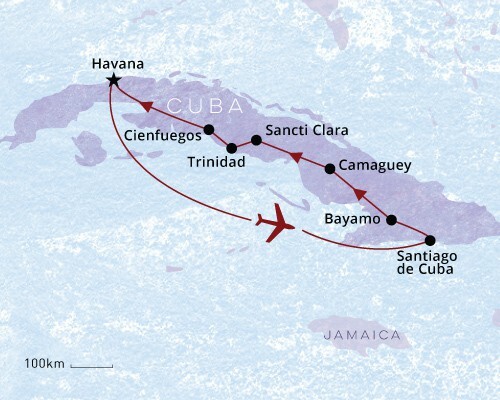 You may wish to add a trip to Mexico or central America before or after your trip in Cuba. 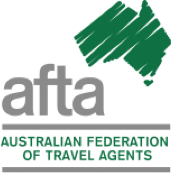 Contact our specialist consultants to arrange a tailor made, private itinerary. Call 1300 784 794 or email contact@satc.com.au.